Chevron lace set (top left):2 balls. 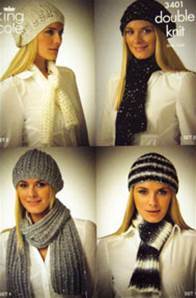 Rib beret and scarf (top right): 4 balls. Rib set (bottom right): 2 balls. Lacy set (bottom left):4 balls. 50g balls King Cole Galaxy wool/ acrylic DK with sequins.